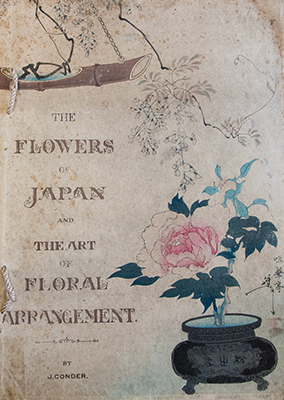 The Flowers of Japan and the Art of Floral Arrangement by Josiah Conder was published by Hakubunsha, a bookseller once in the Ginza district of Tokyo in 1891. One of the striking features of the book are the fourteen beautifully coloured woodblock prints of seasonal flowers, of which six are depicted by Tsukioka Yoshitoshi (1839-1892). Yoshitoshi is often associated with his rather grotesque ukiyo-e imageries. To see his more intimate character through his delicate flowers is all the more a delightful surprise. 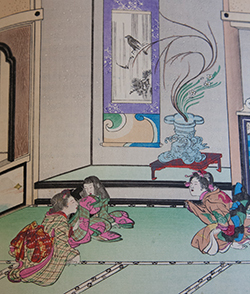 Other illustrations include four prints that depict room interiors by Kawanabe Kyōsui (1868-1925), the daughter of another celebrated ukiyo-e artist, Kawanabe Kyōsai (1831-1889). Her images offer a glimpse of what an ideal room might have looked like with carefully arranged and presented flowers. Josiah Conder who authored the book is a Londoner born in 1852. Having established himself as an architect, he was invited to Japan at the age of 24 in 1877 by the Japanese government. He became an important figure in modernising Japan as Professor of Architecture at the what is now the University of Tokyo and at the Ministry of Industry. Parallel to his official duties, Conder developed a fascination for Japanese art and became a student of Kyōsai in 1881 some four years after his arrival. Kyōsai in return appears to have taken a great liking for Conder and granted him his artist name, Kyōei taking the characters ‘kyō‘ from Kyōsai and ‘ei‘ from Eikoku (England). They remained loyal friends until Kyōsai’s death in 1889. Conder most likely met Yoshitoshi through Kyōsai’s introduction. Yoshitoshi was a student of Utagawa Kuniyoshi (1789-1861). Kyōsai was also a student of Kuniyoshi albeit for two short years when he was between the ages of seven and nine. Conder, while inspired by the many facets of art practices in Japan, had a particularly affinity to ikebana flower arrangement tradition. So much so that he presented a talk entitled ‘The Theory of Japanese Flower Arrangements’ at the Asiatic Society of Japan in 1889. This lecture in turn became the source of the more complete volume, The Flowers of Japan and the Art of Floral Arrangement. A book on flower arrangement may typically conjure images of a step-by-step guides or outline of ikebana principles. However, The Flowers of Japan is a thorough overview of the ikebana tradition as a whole. From covering the history and the philosophy behind the practice the book goes further to include descriptions on selecting appropriate flowers and plants for the season or festive events, and information on how to choose suitable containers and accompanying paintings or calligraphy scrolls to hang. There is also a section on the relationship between the arranged flowers and their placement within the room. The sections are all accompanied by copious illustrations to make the book not only insightful but also visually appealing. Some 120 years on since the publication of The Flowers of Japan, the contemporary Japanese lifestyle has changed dramatically. Accustomed to a more Western style of living, houses in modern day Japan have very little in the way of traditional Japanese-style rooms, let alone ones complete with tokonoma alcoves. Flower arrangement methods for decorating alcoves, as those seen in this book, have therefore little place in contemporary Japanese homes. 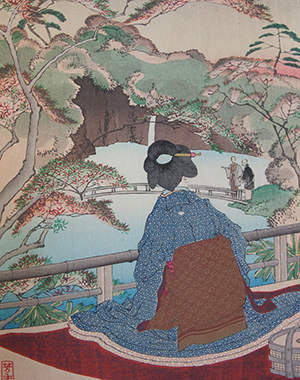 Much of the ikebana tradition has modernized together with the changing society. Arrangements featured in the ikebana calendar produced annually by the Japanese Ministry of Foreign Affairs are good examples to observe how different the arrangements are when compared to traditional aesthetics. During the period when the book was published, however, ikebana was practiced differently. The practice was taken up by both genders irrespective of their social ranks. The shift came After World War II when ikebana and the Tea Ceremony were considered to be more a desirable skill of an eligible young lady, and were practiced by young women as part of their ‘bridal training’. This in turn stoked competing ikebana schools to assert their pedigree by expanding their family operation, the iemoto system, and levying substantial fees to galvanise their wealth. However, in more recent decades marred by low birthrate and population decline, many of the schools are finding it difficult to sustain their lineage. Some even argue that the iemoto system of familial generations may be in danger of collapsing. The iemoto system is built on exclusive access and learning. Publications on the other hand of substantial breadth and insight, such as The Flowers of Japan, offer a more inclusive opportunity and a lasting legacy in promoting knowledge. It is with great pleasure to hold a copy of The Flowers of Japan donated to the Lisa Sainsbury Library by Sir Hugh and Lady Cortazzi to help inspire more readers to the fascinating world of ikebana.